Deer are responsible for about 120 human deaths per year. Alligators, sharks, snakes, and bears combined are responsible for around 4 deaths per year. The two biggest nuclear disasters were Chernobyl and Fukushima. Chernobyl’s nuclear disaster resulted in the death of 31 people. Two died from the blast effects and 29 firemen died as a result of acute radiation exposure. By 2006 a total of 100 deaths could be tied directly to Chernobyl. At Fukushima, 40-50 people were physically injured or received radiation burns. The number of direct deaths associated with Fukushima so far is zero. Every day around 9,500 people in the U.S. are diagnosed with skin cancer. This includes basal cell carcinoma, squamous cell carcinoma, and melanoma. And it is estimated in 2018 that 9,320 Americanswill die from melanoma. Worldwide the W.H.O estimates 65,000 people die from melanoma each year. We are often more afraid of the things that are the least likely to happen while showing little concern for more salient risks. How many times has a fear of a shark attack kept you out of the ocean? Versus how often do you slow down when you see a caution deer sign while driving? How comfortable would you be with a nuclear power plant being built in your city? How often do you go outside without sunscreen and/or adequate clothing coverage? Our fears of low probability events are exaggerated due to a psychological quirk called the availability heuristic. The availability heuristic is a mental shortcut we make. It uses immediate easily recallable examples to answer a question. The more dramatic the event the more easily it is to recall. When thinking about which animal causes more deaths, sharks or deer, we can easily recall all the news reports about shark attacks. You probably also immediately thought about Jaws. Whereas, I would bet that you couldn’t think of a single national story about a death caused by a deer. When you hear about a nuclear disaster your mind probably immediately recalls all those images of mushroom clouds and towns being blown away. The availability heuristic is often triggered when dealing with complex systems like the stock market. With so many variables and moving parts, our brains require a major shortcut to help us make sense of what is going on. So what is our biggest fear when it comes to the stock market? However, from a purely statistical point of view, the odds of a stock market crash are rather low. Vanguard calculated the odds for a market crash, a decline greater than 33%, in any given year at approximately 2%. Not quite as low as a shark attack, but extremely low relative to our collective worry about a market crash. While all of the above are real risks, they don’t necessarily predicate a market crash or suggest a higher probability of a market crash. A few years ago it was the U.S. debt rating downgrade, fiscal cliff, persistently low-interest rates and the ongoing fear of deflation. The world is and always will be a risky place. But digesting these risks through the shortcut of the availability heuristic causes investors to miss a bigger, much more nefarious risk. The long-term erosion of their wealth. We can’t predict the future. But the one thing we can predict with near certainty is inflation. The slow erosion of your purchasing power. If a market crash is like Chernobyl, a very scary but low probability event, then inflation is radiation from the sun. An ever-present risk that we do not pay attention to until it is too late. The long-term average inflation rate is 3.22% per year. If the purchasing power of your money declines every year by 3.22%. $100,000 would lose half its value in 21 years at this rate. The best inflation sunscreen is to invest in high-quality businesses. A high-quality business can raise prices to match inflation helping to maintain your purchasing power over time. A high-quality business that is increasing its sales, increasing its margins, and widening its business moat, can grow faster than inflation thereby increasing your purchasing power. A high-quality business that generates free cash flow and returns it to you the shareholder via ever increasing dividends can help you fight inflation through ever increasing “pay raises”. We don’t know when the market will sell-off and we don’t know when the market will climb. For this reason, worrying about day to day market fluctuations and potential crashes is generally wasted time. Instead, we play the odds and focus primarily on investing in high-quality businesses with growing dividends*. Over time this should provide you with the best inflation sunscreen for your portfolio. *We manage a variety of portfolio strategies, including both concentrated stock and broad asset allocation strategies that incorporate bonds, and other diversifying assets. This discussion is specific to our dividend stock oriented strategies. Please contact us if you want to review your specific portfolio strategy. ¹Both questions are from the book Your Money & Your Brain by Jason Zweig. Our recent investment in 21st Century Fox is a special situation. 21st Century Fox has agreed to sell the bulk of its media assets to Disney, another current portfolio holding, for $52.4 billion in Disney stock. New Fox, the post deal company, will retain Fox News, Fox Business, the Fox broadcast network, Fox television stations, FS1 and FS2, and the Big Ten Network. New Fox will also keep a Los Angeles studio lot. Disney gets everything else. The TV studio, FX, National Geographic, a controlling stake in Hulu, Fox’s movie studio, Fox Searchlight, the Regional Sports Networks. Beneath these entities are media assets like The Simpsons, Avatar, YES Network (Yankees baseball games), X-Men, and Deadpool. The Simpsons predicted Trump and this too. Each shareholder in 21st Century Fox will receive 0.2745 shares of Disney. When we subtract out the assets being sold to Disney we are left with a stub stock for New Fox. We think the market is undervaluing New Fox’s assets and the free cash flow it will produce. We also think the market is undervaluing a post-deal Disney and its future position in a streaming world. Buying 21st Century Fox before the deal is completed offers us a chance to get two undervalued assets. Over the last 10 years, 21st Century Fox’s dividend has grown at a compound annual growth rate of 11.61%. Even after Fox sells the bulk of its assets to Disney, the company will continue to pay a dividend. We don’t know the exact amount per share yet. During the divestment call management said that New Fox will pay a dividend that is equal to the current percentage yield of 21st Century Fox. The current yield is 0.99%. New Fox will also yield 0.99% after the asset sale. Even though this feels like a dividend cut we have to factor in the dividend we are gaining with the 0.2745 shares of Disney. Based on the total deal, 21st Century Fox shareholders end up with a slight increase in total income. During the divestment call Fox’s management stated that the New Fox would’ve generated over $2.8 billion EBITDA on its own in 2017 on a pro-forma basis. Using the 2017 pro-forma EBITDA we estimated New Fox’s 2017 free cash flow would’ve been $2 billion or $1.08 per share. An 11% free cash flow yield. Post deal, New Fox will continue to generate a lot of excess cash that it can use to buy back shares and increase its dividend. The acquisition of most of Fox’s media assets and the creation of a Disney streaming service is one step to a larger Disney as a Service business model. 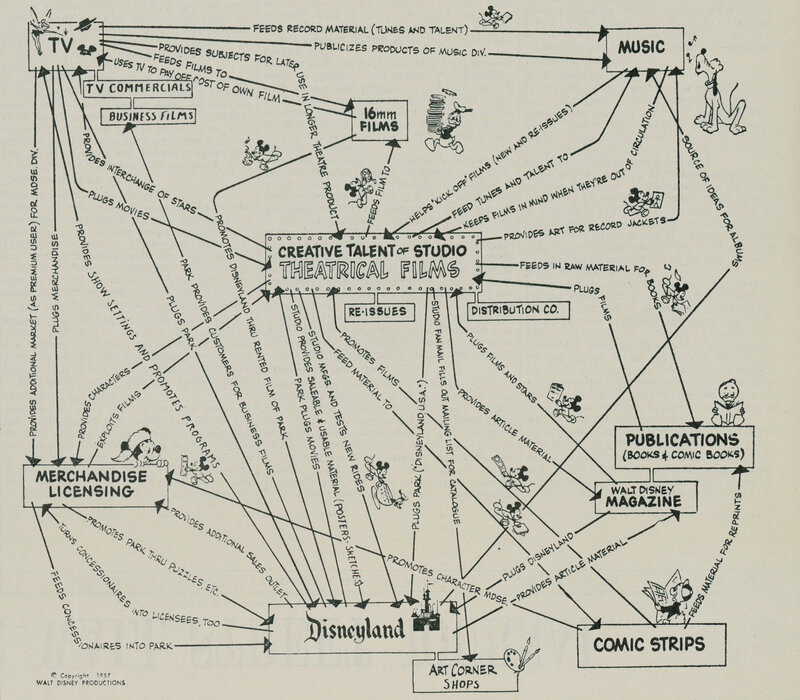 Walt Disney’s Original Business Plan. Disney as a Service is a play on the Software as a Service business model Microsoft is shifting too and that we discussed in Letter 34. The purchase of Software used to be a one-time buy with one large payment at the time of purchase. Then in a few years after the software was updated existing customers would buy the newer version. Putting down another large one-time payment. Now Software companies sell their products as a service. A customer pays a monthly or annual subscription. The software is continually updated. If the software is critical to the business then the customers become very sticky, revenue and cash flow become very predictable, and the software company’s value increases. The service model can apply to consumer subscription service business models too. Like Amazon Prime. Disney’s business seems to rely on the one-big upfront payment model. At least that is the prevailing view. Avengers Infinity War grossed over $1 billion globally in its opening week. The fastest movie to ever hit this milestone. But Disney has to share that revenue with the theaters, cover the movies advertising expenses, and actor salaries. And then do it all again for Avengers Infinity War part 2. What if part 2 doesn’t do as well as part 1? You can see how the one-time upfront business model always involves greater uncertainty about future revenue. What if Disney offered its own subscription service? It’s own Prime offering that offered real value for its millions of fans worldwide. Disney subscribers get meaningful discounts on tickets to its theme parks and priority on rides. Would that increase visits to the park? And increase ancillary spend at the theme parks too? You could also get discounts and first choice for tickets to Disney’s Broadway plays and ice shows. What about reserved tickets for prime seats on opening day for all its Marvel, Pixar, and Star Wars movies? The Disney Prime would also include its streaming services. What if you could get early access to watch every new release from Pixar, Marvel, Star Wars, at home before it is in the theater? And sometime in the future, you’ll only be able to watch the latest Star Wars trilogy on the Disney streaming service. And then what about all the data that Disney would have on its most loyal fans. You’re daughter just watched Frozen 17 times on the new Disney streaming service. Disney now knows all the Frozen related offers to send to maximize your daughter’s joy: the Elsa costume, the Olaf pillow, the Frozen album, the Frozen Christmas album, and on and on and on. The entry point to a Disney Prime model is the streaming service. It is one of the best ways to acquire customers and to increase the lifetime value of your subscription customers. It is why Amazon is ramping up its spending for Prime Video. Amazon knows that with must-watch shows it can convert more casual Amazon customers to its Prime subscription business. Once in Amazon’s ecosystem, the customer sees all the ancillary benefits of being a Prime subscriber and will likely move more of their economic activity to Amazon. Acquiring the bulk of Fox’s media assets increases the attractiveness of Disney’s streaming services and the entry offer to Disney as a Service. For a more in-depth read on Disney as a Service, read this two-part essay from Redef. A subscription service would change the narrative surrounding Disney and increase the value of Disney. Netflix’s market cap is almost the same as Disney’s. But Disney’s revenue is over 4x greater than Netflix’s. And Disney’s trailing twelve month free cash flow is $9.5 billion versus -$1.84 billion for Netflix. Why is Netflix being valued so high and Disney so low? Netflix is a subscription business. It is being valued higher because of the more predictable nature of its revenue and current subscriber growth. Disney is far more profitable but the prevailing story is its cable network business and declining cable subscribers. Investors are worried about how Disney is going to replace its cable subscribers. A Disney streaming service – this includes ESPN – that shows meaningful subscriber activation changes Disney’s narrative. Lost cable subscribers are replaced with Disney subscribers. The initial streaming subscribers may not be as profitable as cable subscribers but Disney would own the relationship. Disney has far greater control on how to retain subscribers and how to increase the lifetime value of each subscriber. Increasing Disney’s long-term profits and cash flows. Eric Jackson of EMJ Capital highlighted how much Disney could increase its value by shifting its perception from a one-off business to a subscription as a service business. “If Netflix has 125 million global households today subscribing to its service, how many could Disney get in five years from now? I think it’s reasonable — especially as China continues to see its middle class grow exponentially — that Disney could attract 300 million subscribers to pay $20 a month for Disney as a service. That’s $72 billion in subscription revenue a year. Today, Disney has $55 billion a year in revenues. And for that, it gets a piddly 2.7 times P/S ratio. Predictable dependable revenue is always valued more than unpredictable revenue. The biggest risk to this deal is anti-trust regulation. Currently, the Department of Justice is arguing against the merger of AT&T and Time Warner based on Anti-Trust concerns. This is unusual because this is a vertical integration. AT&T and Time Warner’s current businesses do not overlap. One is a content distribution and telecom platform the other is a content creator. A deal like Fox and Disney’s is a horizontal merger, a consolidation within the same industry. These types of deals usually get stronger anti-trust reviews. But we think Fox’s deal with Disney has an easier time getting approved. It’s not what you know; it’s who you know. President Trump likes Rupert Murdoch and considers Rupert a friend. This might’ve changed with the release of Fire & Fury. It is no secret that President Trump likes Fox News, especially Fox & Friends. President Trump even called Rupert after the announcement of the deal to make sure Rupert wasn’t selling Fox News to Disney. On the other hand, President Trump does not like CNN. Time Warner owns CNN. This may explain why AT&T and Time Warner are having a hard time getting their deal done. We say this a little tongue in cheek but if Rupert wants this deal done all he has to do is get Fox & Friends to run a segment on how this deal will “make America great again” and the deal is cleared. When Fox first put their assets up for sale Comcast made an offer. It was rejected in favor of Disney’s offer. Part of the assets Fox is selling to Disney is its 39% stake in Sky Broadcasting. Fox is trying to buy the rest of Sky and sell 100% of Sky to Disney. Fox’s offer for the rest of Sky was accepted by Sky’s board but the deal is under review by British regulators. Comcast has now made an offer for Sky Broadcasting that is much higher than Fox’s. At first we weren’t sure what Comcast was doing. Did they just want Sky because of its valuable cable and media assets? Or was Comcast trying to disrupt the Fox Disney deal? As we write this rumors are coming out that Comcast is trying to expand its bridge financing to offer $60 billion for the assets Fox is selling to Disney. Comcast’s new deal would be an all cash offer again. If Rupert Murdoch and his family wanted to sell to Comcast they would’ve taken Comcast’s first offer which was more than Disney’s offer. For tax and estate planning purposes, Rupert Murdoch does not want an all cash deal; he wants a stock deal. The Disney offer is an all-stock offer. Plus, Rupert and his family become major shareholders in Disney. If the future of TV is streaming – it is- then a combined Disney and Fox is much stronger than a Comcast and Fox. As shareholders in 21st Century Fox this new deal isn’t much of a risk. If the Murdochs choose to go with Comcast at a higher price we get paid more as shareholders. This is a risk to Disney as a Service. Disney has a deep content library but it gets deeper and better with Fox’s assets. Without Fox’s assets Disney’s streaming ambitions are hampered. A new offer from Comcast is also dependent on the AT&T and Time Warner deal passing anti-trust regulation. We think it will and Comcast does too. Why else would they be lining up financing for a new offer? The most likely outcome is Disney increases its bid for Fox to appease the fiduciary duty Fox’s board has to the rest of 21st Century Fox shareholders. Disney’s cable networks and broadcasting divisions are extremely profitable. But they are facing a major headwind. Cord cutting. Disney is trying to balance its move to streaming while not disrupting it’s still profitable cable business. But someday Disney will need to go all-in on streaming. It is the only way to fully leverage Disney as a Service. When that day comes Disney’s operating income from its cable and media networks will take a big hit as it cannibalizes its cable subs for subscribers to its streaming service. Not an apples to apples comparison but Adobe Systems switched from its old profitable business model to a subscription business in 2013. And this is what happened to Adobe’s net income. This is Adobe’s change in annual income and change in stock price through year end 2017. When Disney flips from prioritizing its cable networks to prioritizing its streaming service it will lose its cable network revenue and operating income. But Disney will be replacing the lost revenue and profit with subscribers to its streaming service. As we mentioned above, Disney will own these relationships directly. This gives Disney more control on how to retain subscribers, increase revenue, and increase profit per subscriber. And a Disney as a Service business will earn a higher valuation multiple than what its cable network business is receiving today. At the beginning of Ghostbusters, Egon Spengler warns his ghost busting associates not to cross the proton streams emanating from their proton packs. But at the end of the movie to defeat Gozer the Traveler, aka the Stay Puft Marshmallow Man, Egon recommends that they cross all four of their proton streams to defeat Gozer. It worked. Disney’s plans for over the top streaming efforts remind us of Ghostbusters. Disney will have a streaming service targeted to kids under the Disney name, Hulu will be aimed to the older crowd, ESPN+ is for the sports fan. Netflix keeps all its content, both kid and adult oriented, under one roof. And we think ultimately Disney will need to corral all of its different streams into one. It is a better selling proposition to the customer. The depth and variety of the content under one service increases the lifetime value of a subscriber. A young family may sign up just to get the kid friendly content but then the parents remain subscribers after they get hooked on all the adult oriented programming and live sports offerings. If Disney tries to keep all its streams separate it will be confusing for the customer and it could increase customer churn at each separate stream. Higher churn rates lowers the lifetime value of each subscriber and lowers the value the equity markets will give you. Disney needs to cross the streams. At the time of our purchase, Disney was trading at $101.79 per share and 21st Century Fox was trading at $37.77 per share. The table below is how we get the New Fox stub stock value and our base case intrinsic value for the New Fox stub stock using the average Enterprise Value-to-EBITDA multiple of 21st Century Fox’s closest competitors. We think New Fox has 22% upside post Disney deal.